Below is an article published yesterday on the Bloodstock South Africa website following Backworth’s ‘tremendous treble’ on the weekend with the Duncan McKenzie-trained Spectacularus, the Gavin van Zyl-trained Too Much Fun and the Frank Robinson-trained Go Again! “The Backworth Stud has enjoyed a cracking start to the 2013-2014 season. The farm who have been loyal and stalwart Bloodstock South Africa supporters over the years, enjoyed a fine treble over the weekend. The first leg of the Backworth hatrick kicked off when Spectacularus broke her maiden in fine fashion on Friday. A daughter of former Eclipse Champion Miesque’s Approval, Spectacularus was a cheap R25,000 buy at the 2011 Suncoast Casino KZN Yearling Sale. Well done to owners Backworth Stud, and Messrs Levy and Rivalland - this filly has already earned back her purchase price! Second of the Backworth winners to score over the weekend was the Admire Main-sired filly, Too Much Fun. The Winston Chow owned filly showed her appreciation for a step up in trip by saluting impressively over 1600m, and she is another who should win her share of races. 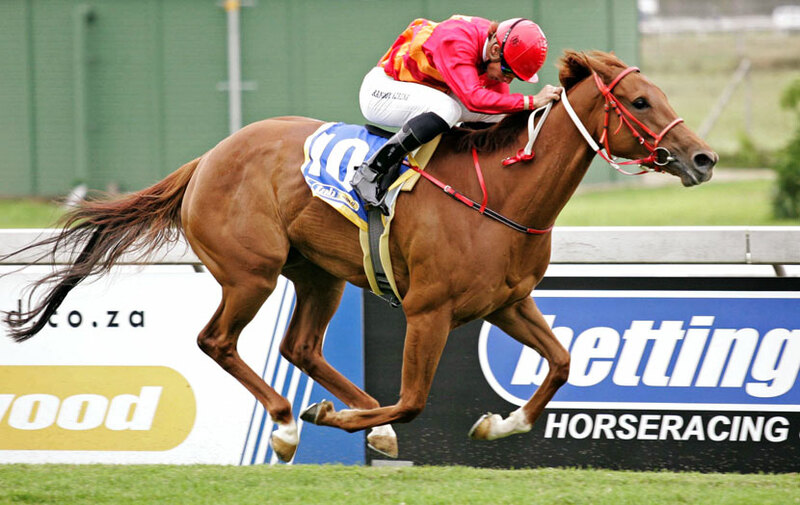 Too Much Fun (whose dam Merriment is a half-sister to Grade 2 winner Superwood) was a R140,000 buy at the 2012 Emperors Palace National Yearling Sale. She is a filly with a lovely pedigree (Too Much Fun is from the great Soho Secret family), and hopefully she can go from strength to strength. Go Again completed the hatrick for Backworth with a brave victory at Clairwood Park on Sunday. The Frank Robinson-trained gelding (who is a full brother to smart, Grade 2 winning filly First Again) narrowly prevailed in a thrilling finish to win by the shortest of short heads for his connections. The son of Muhtafal was a R600,000 buy for owner Mr Bifov at the 2011 Emperors Palace National Yearling Sale. Bloodstock South Africa would like to congratulate Backworth’s Keith Russon and Ian Todd for this fine achievement. "It's always a relief when the last foal of the season is born"
It is always a relief when the last foal of the season is born, where Miss Unimac delivered a beautiful A.P. Answer colt. Even more exciting for the foals, was our first full sunny day in what seems like months. Here in a nursery paddock are 4 of the month old foals!! Merriment and her colt bonding, Fancy Flutter hiding behind mother, Collection Prive’s a bit pensive, and Ramp Model’s showing off her blaze! This season Merriment is visiting King’s Chapel, Fancy Flutter and Collection Prive are visiting A.P. Answer, and Ramp Model will be making the trip to Mauritzfontein in Kimberley to visit Ideal World. Backworth welcomed the visit of South African turf legends Herman Brown Snr and Herman Brown Jnr, accompanied by Herman’s wife Natasha, to inspect our draft of yearlings for the 2012 Emperors Palace National Yearling Sale. They’re seen here viewing Lot 90 ‘Too Much Fun’! 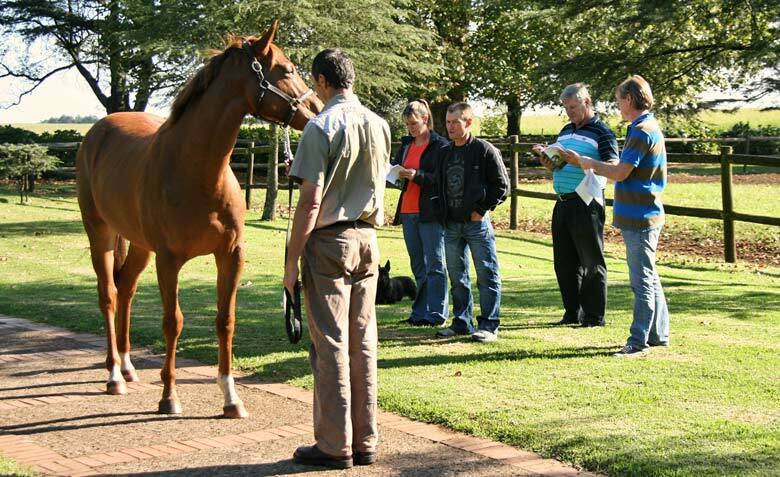 Backworth welcomed the visit of Summerveld-based training duo, Alyson and Kevin Wright, to inspect our draft of yearlings for the forthcoming Emperors Palace National Yearling Sale. They’re seen above with patron John Jones, inspecting Lot 90 Too Much Fun (SAF) (Admire Main (JPN) - Merriment (SAF)).